Originally published in 2010 as Kansas Geological Survey Bulletin 257. Rocks of Permian age in Kansas were first recognized in 1895, and by the early 21st century the internationally accepted boundary between the Permian and the Carboniferous (Pennsylvanian Subsystem) was recognized in Kansas at the base of the Bennett Shale Member of the Red Eagle Limestone. The upper boundary of the Permian is an erosional unconformity that is overlain by rocks of Cretaceous age. Currently accepted stratigraphic nomenclature for the Permian of Kansas recognizes the Wolfcampian, Leonardian, and Guadalupian Series, and the lithostratigraphic formations within each of these series reflect a wide spectrum of depositional environments. Summaries of the lithofacies, thicknesses, depositional environments, and source areas of, and for, the rocks in each series provide a basis for inferring the history of the Permian in Kansas as currently understood. Fluctuations from shallow-marine to terrestrial environments associated with climate change as a result of the waning of Gondwana glaciers and latitudinal shifts are recorded in the Permian rocks of Kansas. Economically these Permian rocks have been, and are, an important source of hydrocarbons, salt, gypsum, building stone, aggregate, and ground water. This report on the Permian System in Kansas is "a work in progress" and future multi-disciplinary studies of chrono- and sequence stratigraphy, climate history, structural aspects, sediment transport, and diagenesis will further enhance our understanding of the end of the Paleozoic in Kansas. 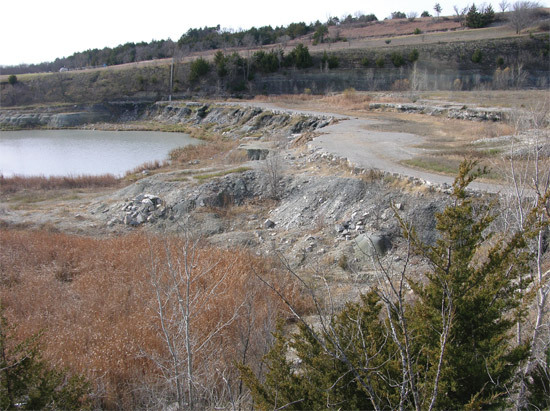 Cover photo--The broad, flat surface in the center of the photo is the top of the Glenrock Limestone Member of the Red Eagle Limestone and the Carboniferous-Permian boundary at Tuttle Creek Lake Spillway in Pottawatomie County, Kansas. This volume is available as an Acrobat PDF version (9.6 MB). The Kansas Geological Survey does not guarantee this document to be free from errors or inaccuracies and disclaims any responsibility or liability for interpretations based on data used in the production of this document or decisions based thereon.